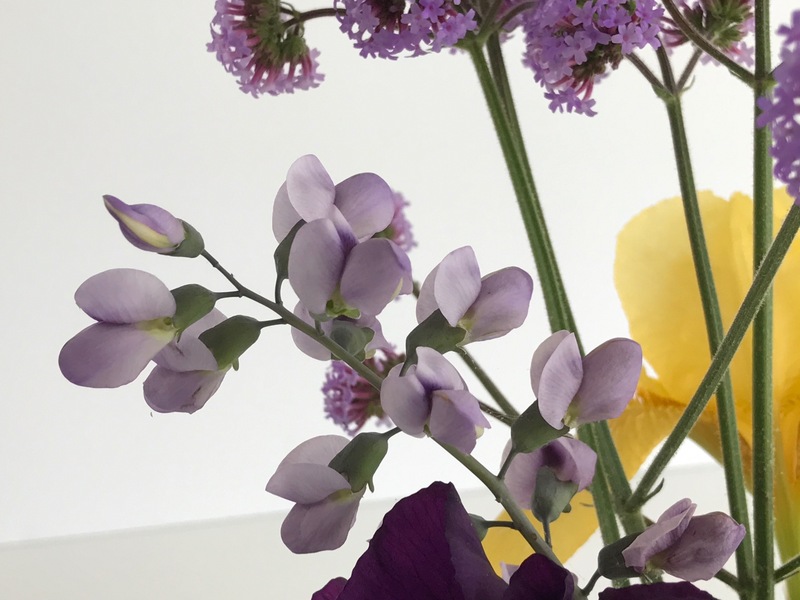 Today’s vase title comes from a flower description I happened upon by the late garden writer Henry Mitchell. 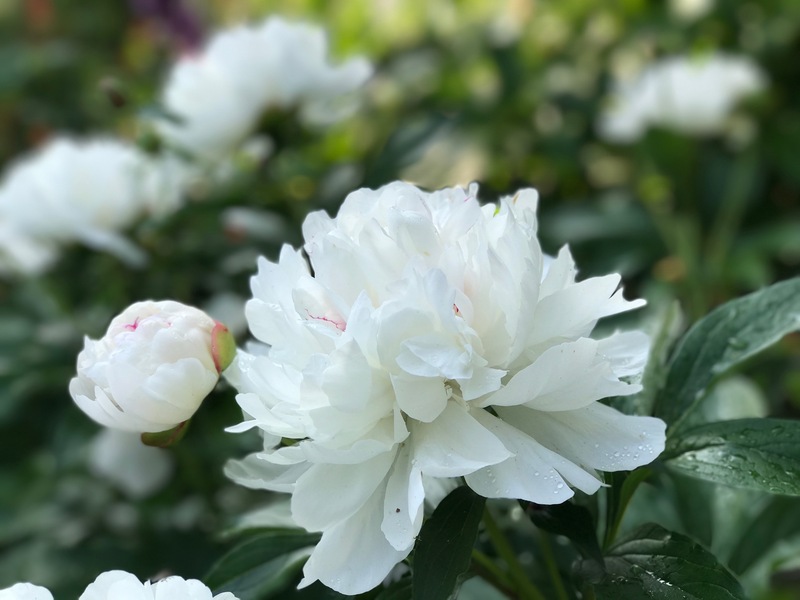 Paeonia ‘Festiva Maxima’ opened last week and it easily lives up to that characterization. I knew it would find a place of honor in this week’s design. 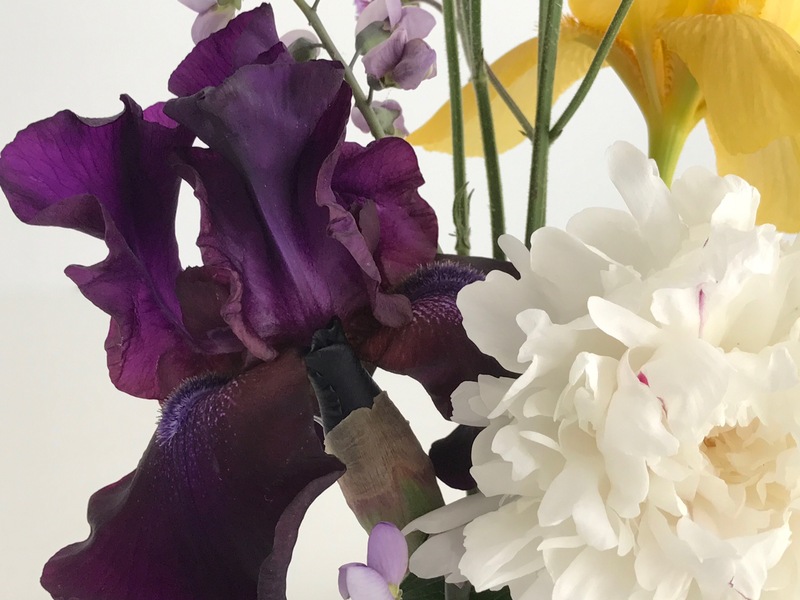 Another majestic flower, regal and dramatic, is a black-bud-opening-to-dark-purple ruffled iris, a wonderful pass-along from a former neighbor. 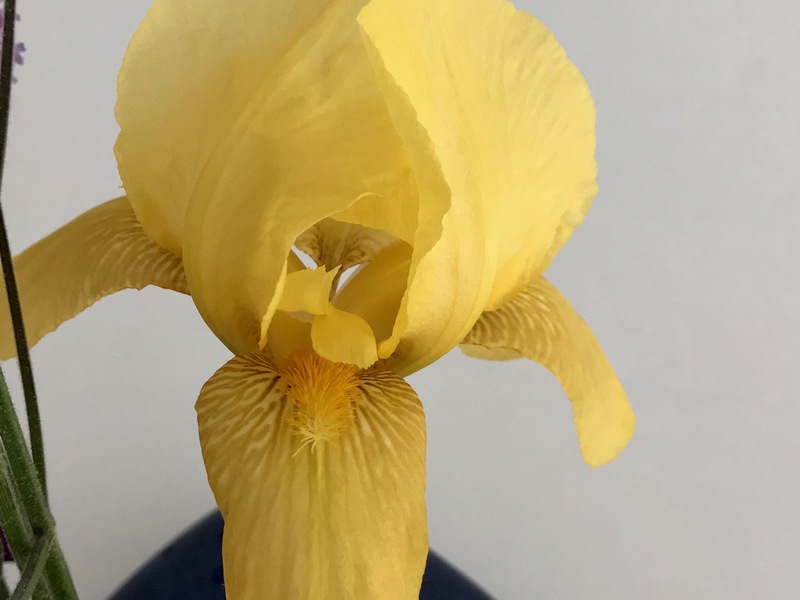 Less dramatic than the darker iris, the yellow iris is also a pass-along, circa 1976, and was brought from my former garden to this one in 2001. 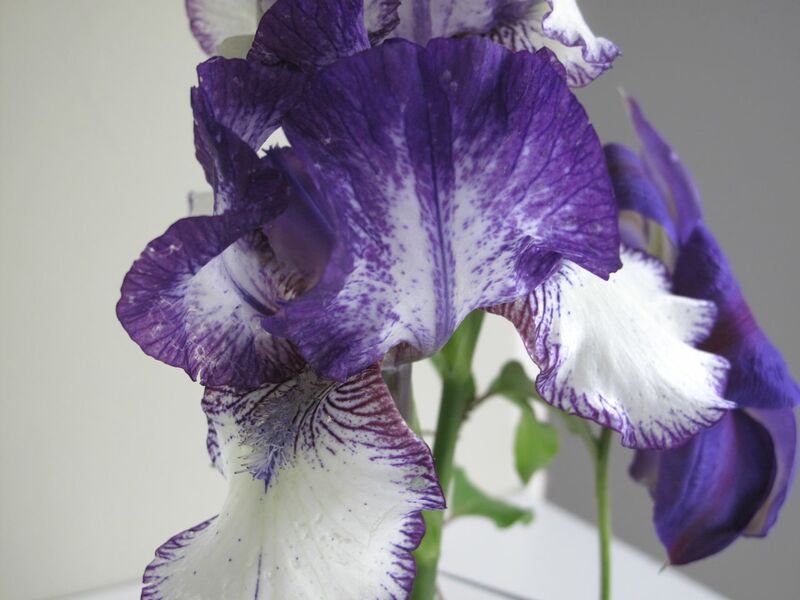 The older irises in my collection are more demure and understated. Baptisia ‘Purple Smoke’ which grows along the Southern side path is having an exceptional year. 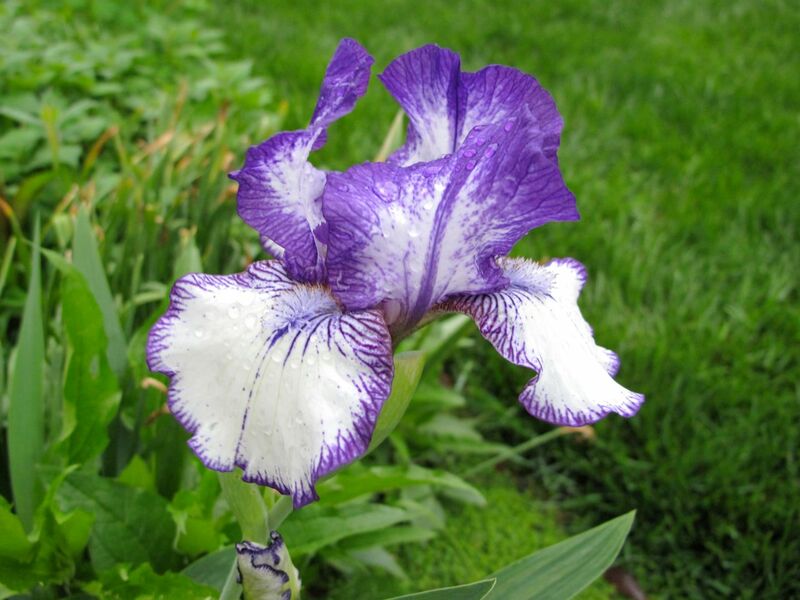 Its smoky lavender hue is echoed in the speckled portion of the iris falls, just under the beard. 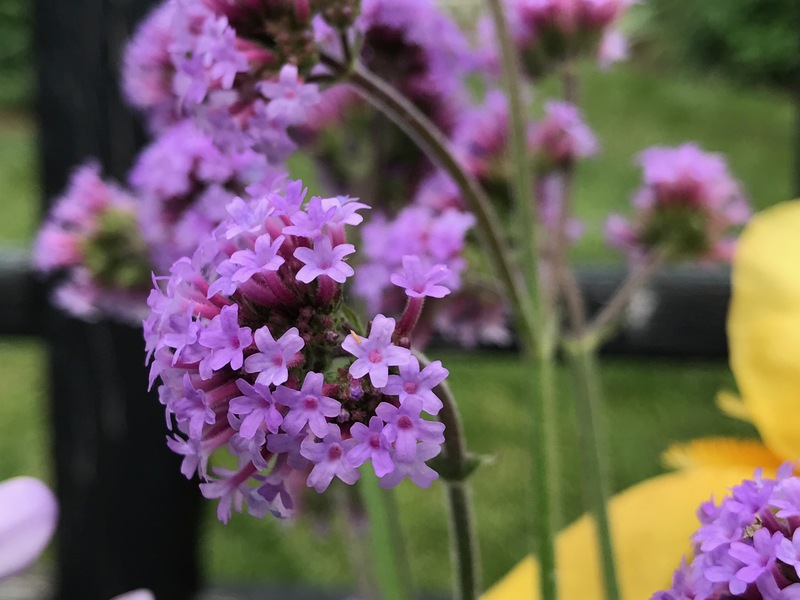 Drifts of Verbena bonariensis are starting to accent the borders. 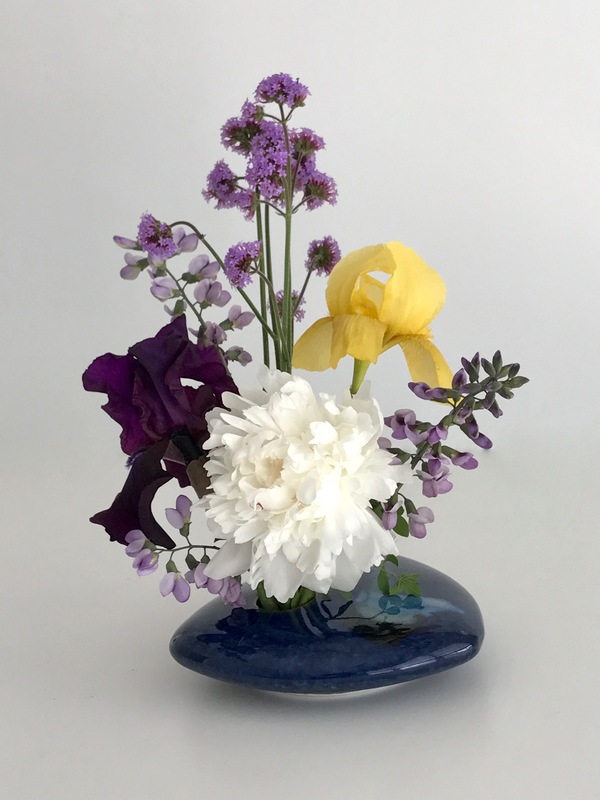 In the vase today it adds height and reinforces the color theme. 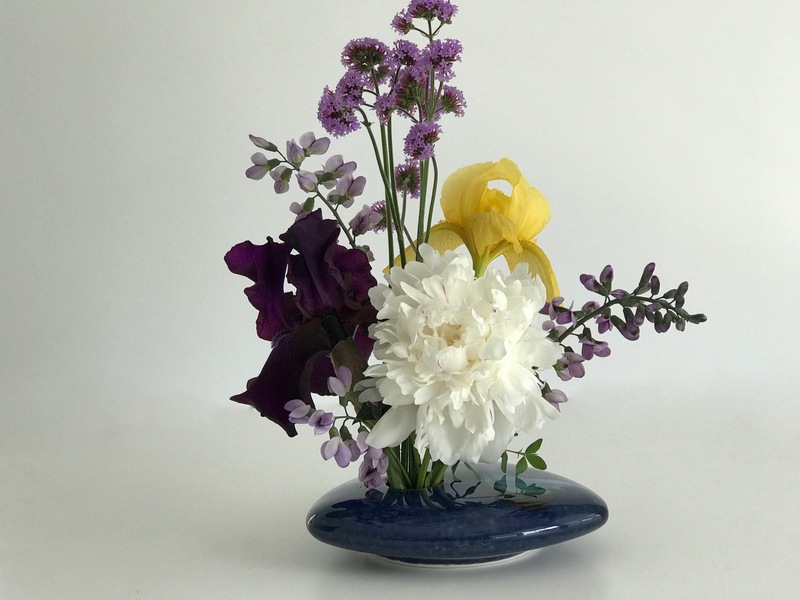 The arrangement was designed with the peony facing the front. 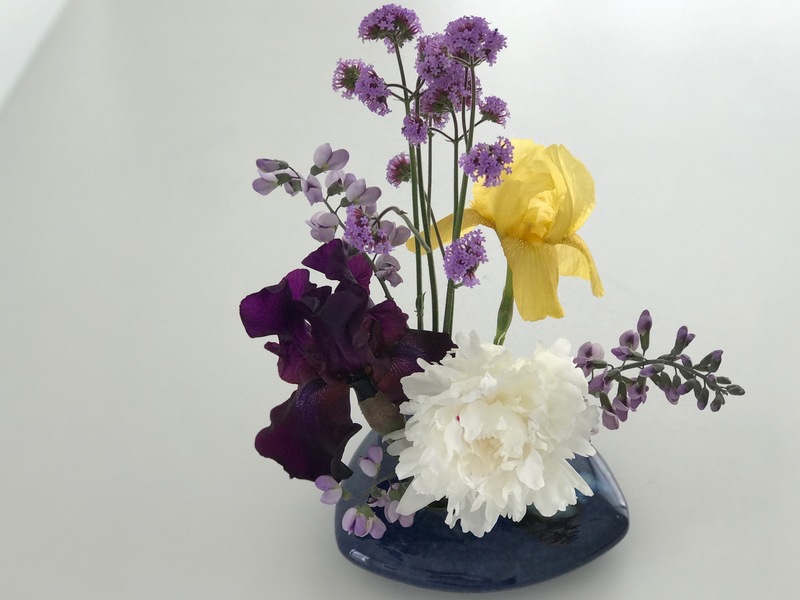 I like the subtle change to the arrangement brought by rotating the vase slightly so the peony is viewed more to the side. and a couple more views for my records. 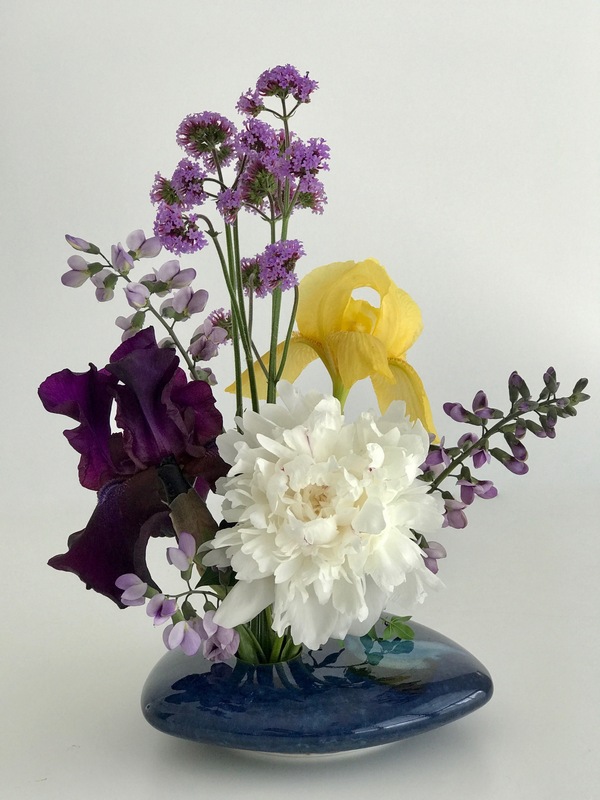 This entry was posted in garden and tagged 2017vase, flower arranging, flower design, in a vase on monday, Iris germanica (Bearded iris), nature photography, Paeonia ‘Festiva Maxima’ on May 1, 2017 by pbmgarden. 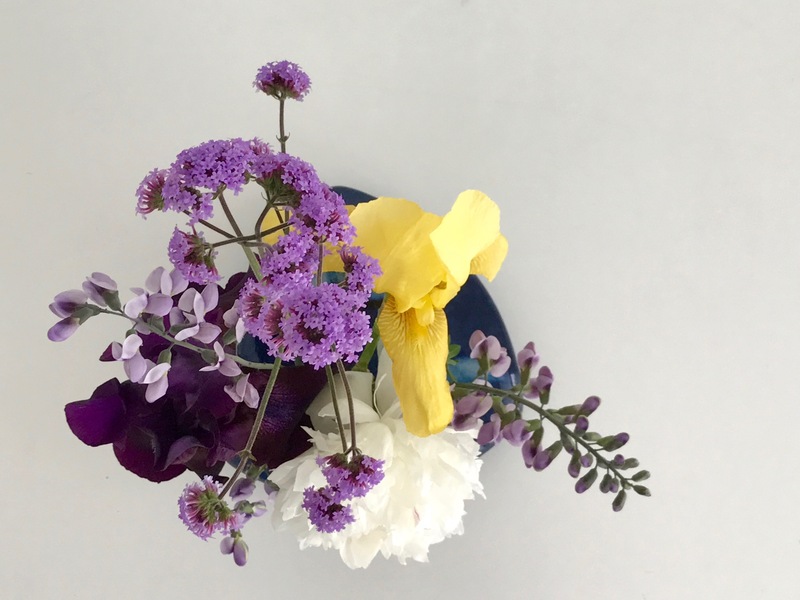 Once again I am joining Cathy for In A Vase On Monday, a weekly challenge to fill a vase using materials gathered from one’s garden. The garden is in the stage where one needs a pause button. It changes noticeably from day to day. Yesterday there was rain from early afternoon throughout the night. The flowers looked drenched this morning. 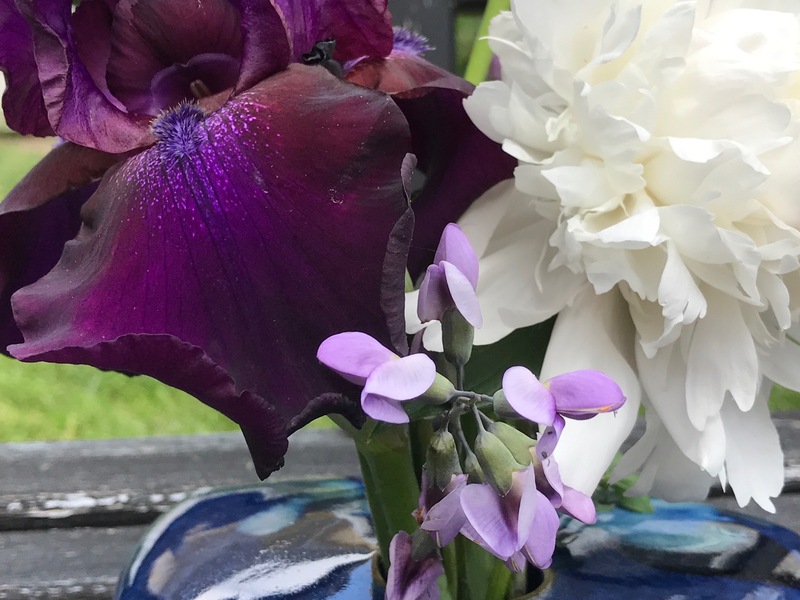 I rescued several bearded irises that had fallen over. 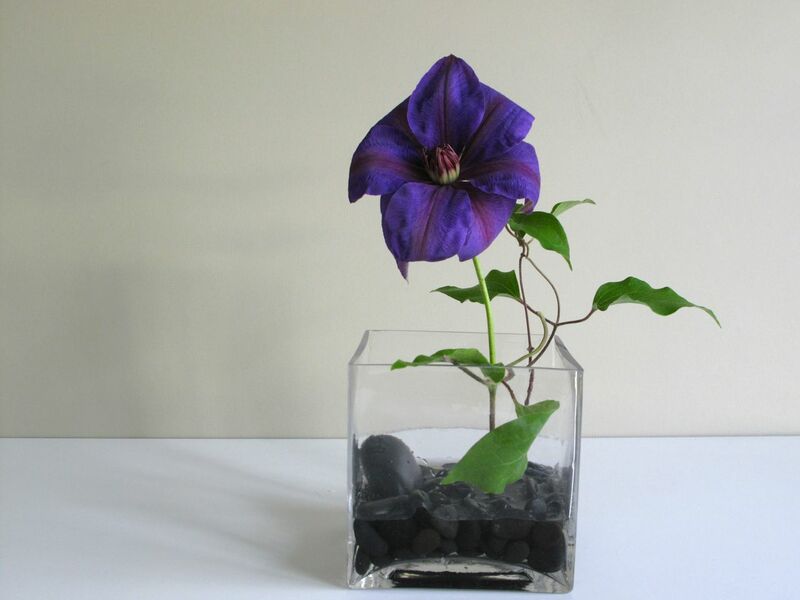 My plan for this morning was to created an arrangement using Clematis ‘Jackmanii’ but in the end I was reluctant to cut more than one. 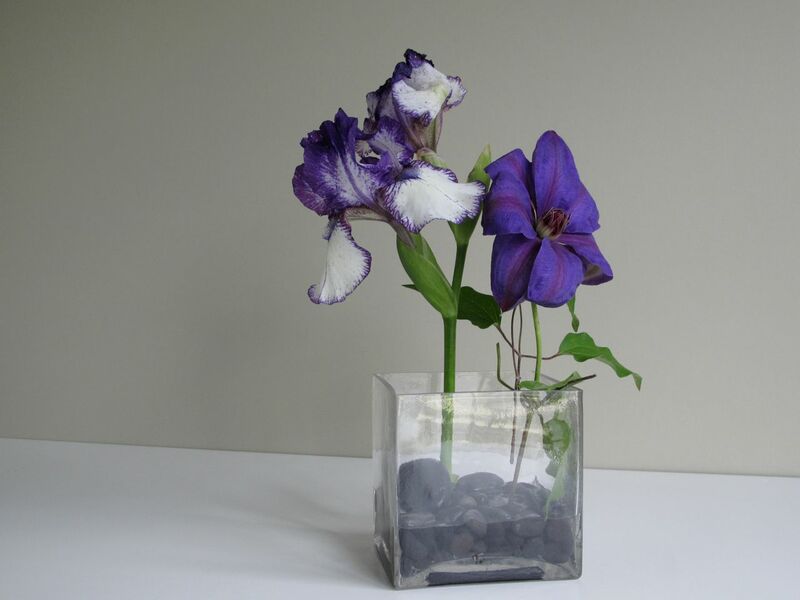 It proved tricky and uncooperative to work with, unhappy in 5 or 6 different vases I tried. 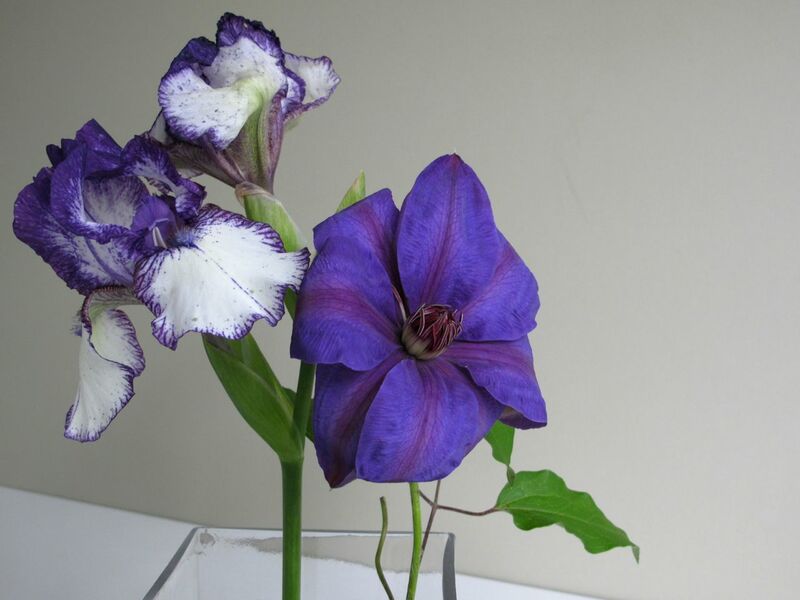 Clematis has potential as a cut flower and is reputed to last up to 2 weeks, but I will have to experiment more some other time. Many thanks to Cathy at Rambling In The Garden for hosting. 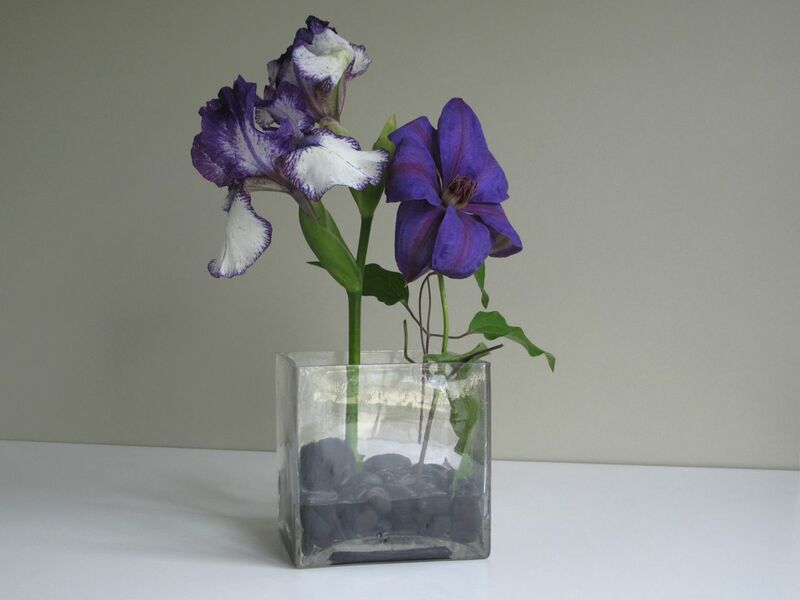 Please visit her to see what she and others are placing In A Vase On Monday. 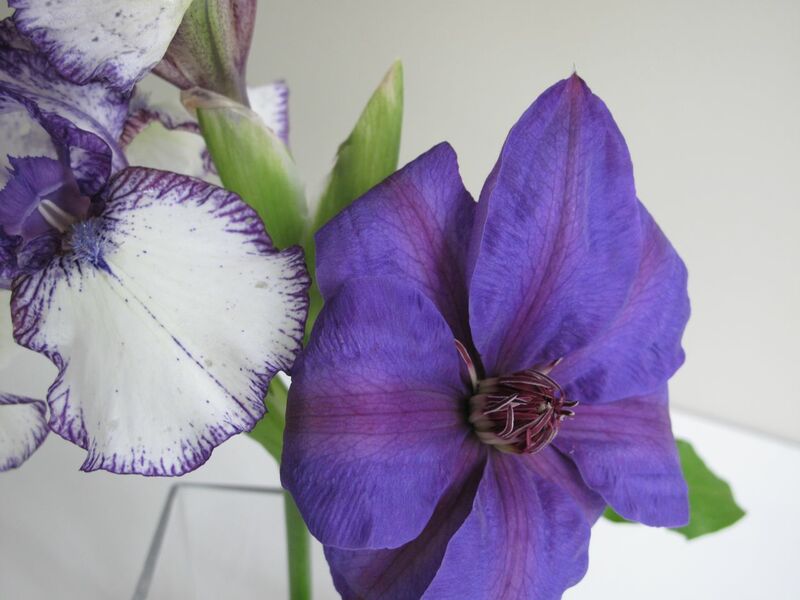 This entry was posted in garden and tagged clematis jackmanii, flower arranging, flower design, garden photography, in a vase on monday, Iris germanica (Bearded iris), nature photography on April 20, 2015 by pbmgarden. 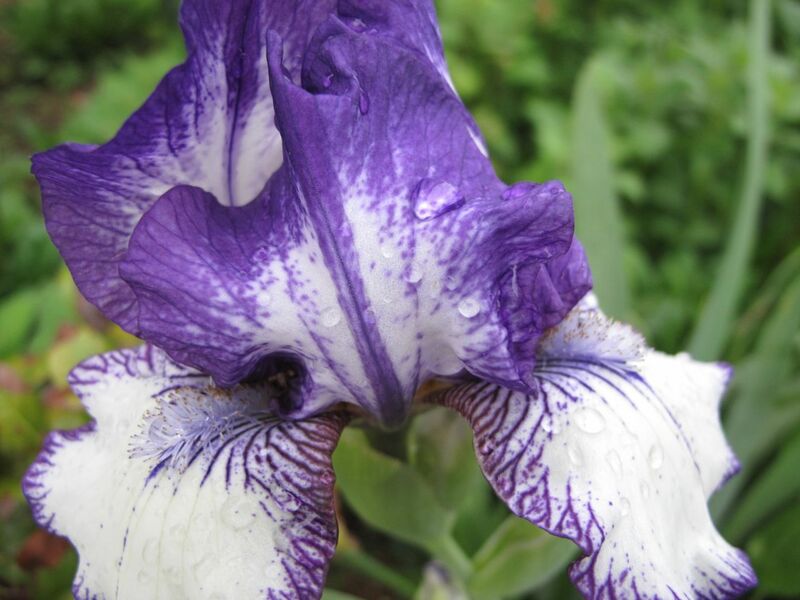 This dramatic iris opened overnight, unharmed by a heavy rainstorm. 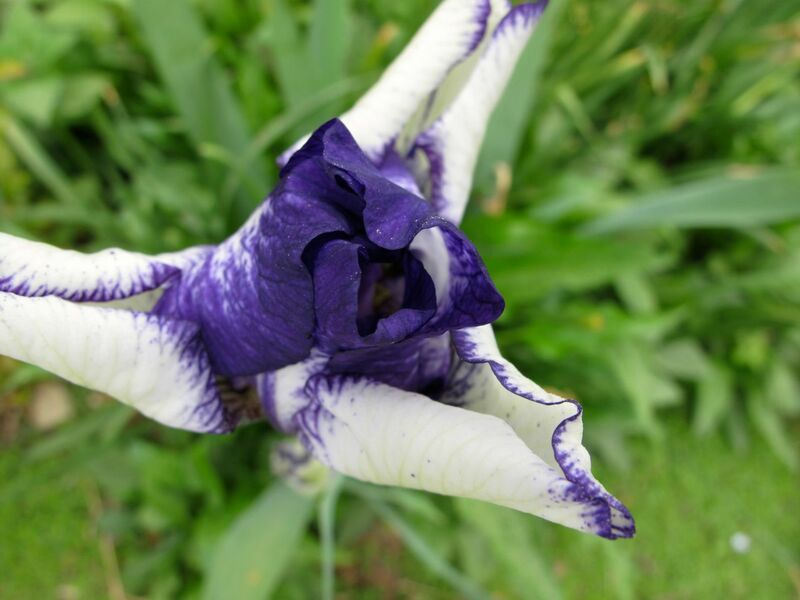 At first I thought it was Iris germanica ‘Batik’ but after seeing it opened I am not sure. 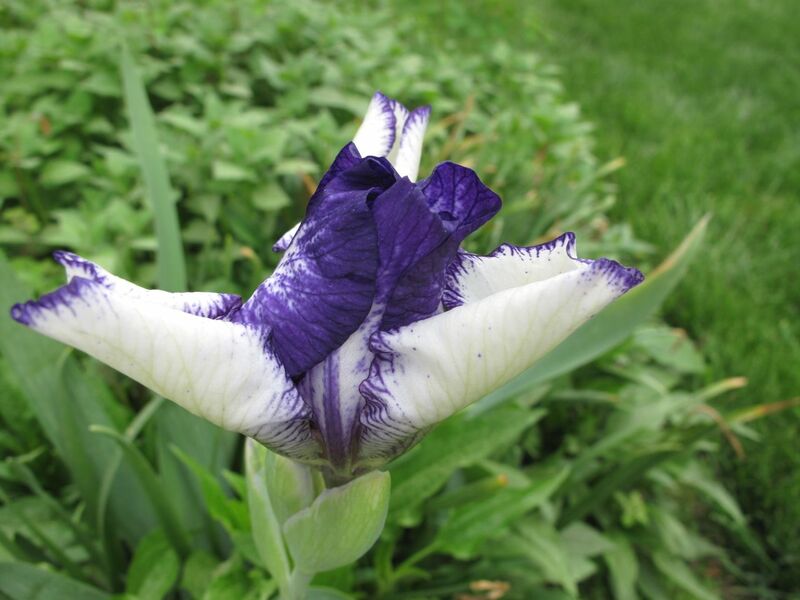 This entry was posted in garden and tagged Iris germanica (Bearded iris), wordless wednesday on April 15, 2015 by pbmgarden.